Strategic Habitat Units in the following hydrologic unit (HU)-4 sub-regions in Alabama were identified to focus conservation activities for managing, recovering, and restoring populations of rare fishes, mussels, snails, and crayfishes. majority of this sub-region which results in the highest concentration of karst in the state. Alabama River sub-region, drains into the highly productive and diverse Mobile Delta. The Alabama sub-region begins in Georgia and ends in Alabama in the Mobile Delta. Covering 22,655 square miles, the Alabama sub-region includes the Coosa River, the Tallapoosa River, and the Cahaba River. These rivers have higher minerality and clarity than those of the Cumberland Plateau and the Coastal Plain because of the Valley and Ridge and the Piedmont physiographic features. A large number of manmade reservoirs pepper the basin and are known for quality fishing opportunities. 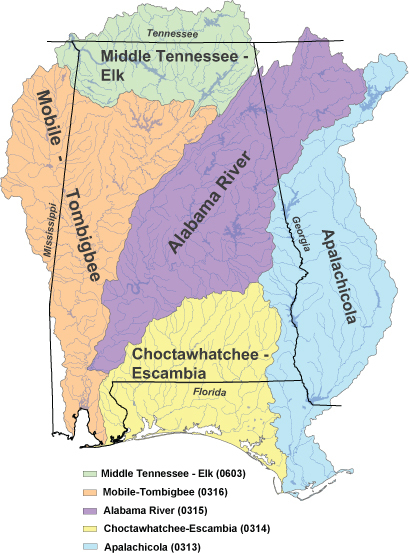 The Choctawhatchee-Escambia sub-region is entirely in Alabama's coastal drainage system and flows into the Gulf of Mexico. It is 14,342 square miles in size and includes the Conecuh River, Murder Creek, the Pea River, and the Choctawhatchee River. This sub-region can be identified by rolling hills, slow and muddy to sandy bottom streams, and broad alluvial floodplains. The Apalachicola sub-region is 20,198 mi2 and falls in Georgia, Florida, and Alabama. Uchee Creek. This sub-region begins in the Appalachian Mountains and ends in the Gulf of Mexico.